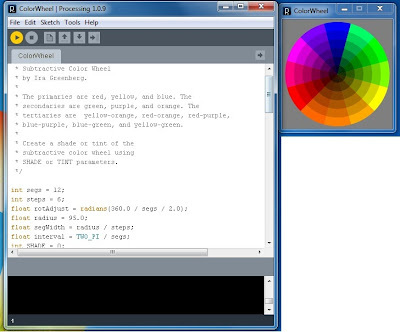 I've recently been developing Java Graphical applications using a piece of software called processing. 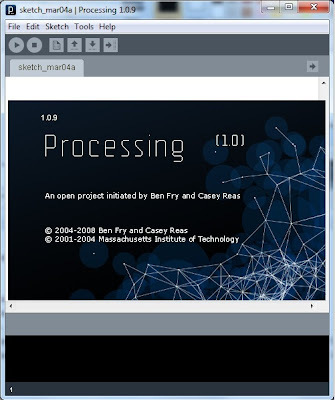 Processing is an open source project which has a very simple IDE and is based on the Java language that can be used to generate graphics and just about anything your imagination can stretch to with minimal effort. The whole idea behind processing was to enable non techie people to get into using code for art and design, however the processing framework can easily be imported into eclipse IDE or Netbeans if you want to push your work further. The IDE allows you to start with simple Java scripts called Sketches which generate Java Applets to display your creations. This is fantastic for beginners as these sketches hide all the intricacies of Java from the developer and allows them to just get on and code. As people learn more they are able to break out there projects into classes (which are treated as inner classes at compile time) and then move there sketch into a fully fledged IDE in the future should they wish. I think this could be a fantastic learning platform for the OU to take advantage of, and anyone out there interested in generating graphics in Java should also take a look. I've done some more advanced stuff using Processing within eclipse which I am happy to make available to give advanced users an idea on how to get started. I would recommend checking the forums and getting started guides over at Processing.org.